This is one of those books where the cover grabbed my attention. Not the current cover but the older version of the cover. There was something so haunting and yet intriguing about it that just grabbed my attention. And I am so thankful that I picked up the book and gave it a read. To be honest it was introduction to the writings of Kelly Barnhill but I know it will not be my last book by her. In fact I started a second as soon as I finished this one. While reading this I could barely put it down, in fact I read it in under 3 days and in three sitting. 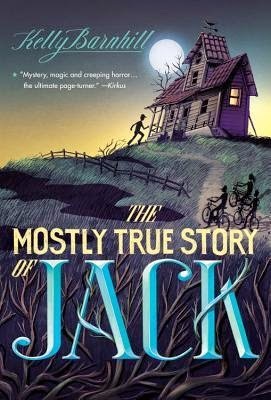 This is the story of Jack a young boy who has always felt invisible, even in his own family. But when his parents are going through a separation he is sent to live with family in Hazlewood, Iowa to live with his aunt and uncle. And he no longer seems invisible, in fact everyone one seems to see him and want him for something. He makes friends for the first time with Frankie, Wendy and Anders. He is also beaten up by the town bully Clayton Avery. Clayton's farther MR. Avery is the most powerful man in town and he seems to have it out for Jack from the time he becomes aware he is in town. This is a story about friendship, about healing, about magic and about finding your place in the world. 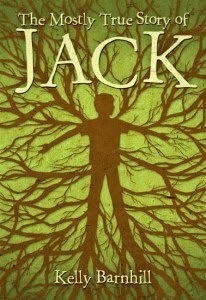 Jack encounters each of those elements and as the story progresses it also becomes a tale about sacrifice. Sacrifice for a greater good, for those you care about, for friendship and for doing what is right even if it is really really hard. This was a great read. I highly enjoyed it and can also highly recommend it. One of the greatest compliments I can give a book is my plans to share it with my children when they are older. This book is on that shelf waiting to be read again this time with them. Overall a very good book!